Some of this year’s participants are, from left: Ryan Sullivan, Emily Colgrove, Jim Kinnard, Lori Ann Macklin, and Adam Kenney. This year’s event will tip off at 5:45 p.m. and then 7 p.m. Wednesday, Oct. 21. 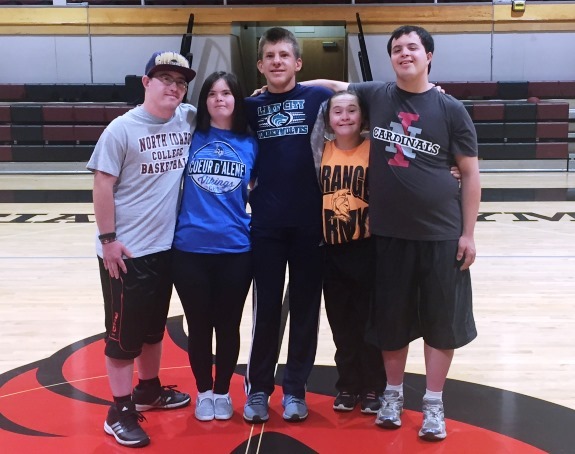 For the fifth year, North Idaho College will host a Special Needs Basketball Extravaganza Wednesday, Oct. 26, in Christianson Gym. The first game will tip off at 5:45 p.m. and the second game will tip off at 7 p.m. The extravaganza is a chance for our special needs athletes to experience the bright lights and wild atmosphere of a big time college basketball game. Athletes are introduced on the court with smoke machines and laser lights while being announced on the loudspeaker. NIC basketball players and coaches also help make it a special night for all the players. The free event is sponsored by Real Life Ministries and NIC. The Associated Students of North Idaho College will be holding a food drive to benefit the NIC Food Pantry. Please bring a non-perishable food item to benefit the pantry. Information: Cal DeHaas at (208) 769-3440.